Fish oil is popular dog supplement. Liquid fish oil for dogs is a convenient way to make sure your dog gets enough omega 3 fatty acids. Side effects from giving your dog fish oil are extremely rare. There are though few things worth having in mind before you start giving your dog omega oil supplement. Fish oil for dogs includes fatty acids and is therefore high in calories. Fat has 2.25 times more calories than protein or carbohydrates. So if your dog has weight problems, then you may want to reduce accordingly the amount of calories he gets from his diet. Bear in mind that fish oil and cod liver oil is not the same. Fish stores fat either in the body or in the liver. The best fish oil for dogs comes from fish that stores the fat in the body, like salmon, tuna, mackerel, sardines and menhaden. This is because fish also store Vitamin A and D in the liver. Meaning supplement containing fish liver oil contain high level of those vitamins. Excessive levels of Vitamin A and D can harm the liver and using fish oil, not fish liver oil, eliminates the risk of accidental overdose. The fish oil used in maxxiomega is from menhaden but it stores the fat in the body. Maybe the most annoying fish oil side effects for dogs are fishy breath or fishy smelling skin. One of the frequently mentioned benefits of maxxiomega is that it does not leave fishy smell. This is because maxxiomega does not only contain fish oil for dogs, it also contains vegetable oils for additional health benefits. Stomach upset is very rare side effect but dogs with sensitive stomach may experience mild diarrhoea when fish oil is first added to their diet. Starting with low dosage and gradually increasing the dose is usually enough to alleviate this problem. Inflamed pancreas is another potential fish oil supplement side effect. This is fortunately extremely rare but the symptoms include vomiting, diarrhoea, pain, and dehydration. The bottom line is that side effects of fish oil for dogs are very rare. Vast majority of dogs thoroughly enjoy and benefit from omega oil supplementation. However, there can be a lot of obstacles to a healthy coat. A minor irritant or allergy can cause your dog to itch, loose glossiness and coat thickness, or even worse, experience skin blemishes and soreness. 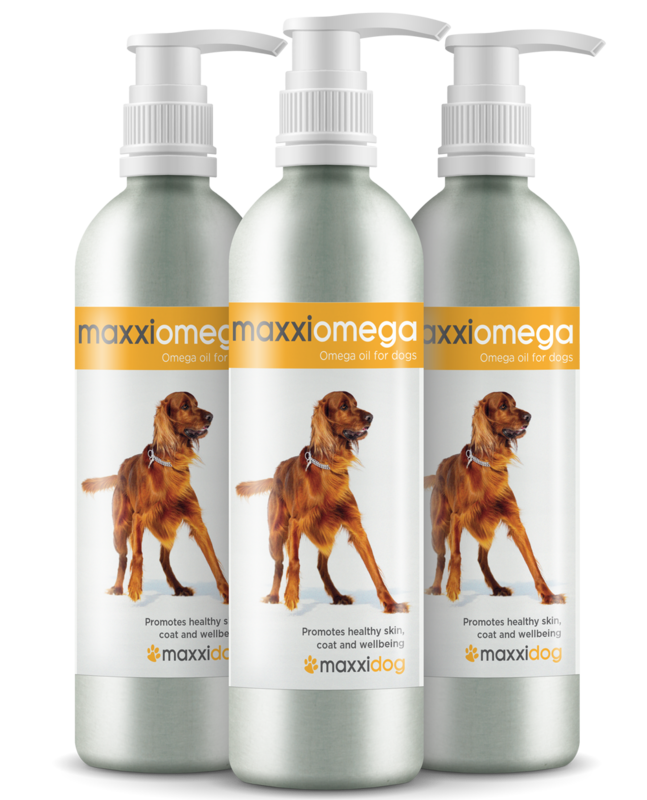 Our maxxiomega is designed for dogs of all ages, supporting the proper balance of fatty acids, vitamins and antioxidants from the inside so their health shines through.